Open the books on PFI! 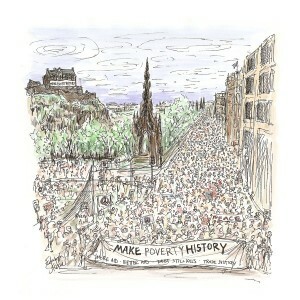 Make Poverty History Limited Edition sketch available now! Half of all proceeds will support Jubilee Scotland's campaigns for debt justice. Jubilee Scotland is an independent coalition of organisations and local groups across Scotland who campaign for cancellation of the unjust and unpayable debts which are ruining the world’s poorest countries.